Product prices and availability are accurate as of 2019-04-11 10:10:22 EDT and are subject to change. Any price and availability information displayed on http://www.amazon.com/ at the time of purchase will apply to the purchase of this product. Balsam, aromatic cedar wood and juniper berry blend together in a fresh forest scent.Fragrance Notes:Top: Crisp Citrus, Herbs, Red BerryMid: Pine Balsam, Cedar, Sandalwood Base: Vanilla, Warm Amber, Musk Top note is the initial impression of the fragrance, middle note is the main body of the scent and base is its final impression. 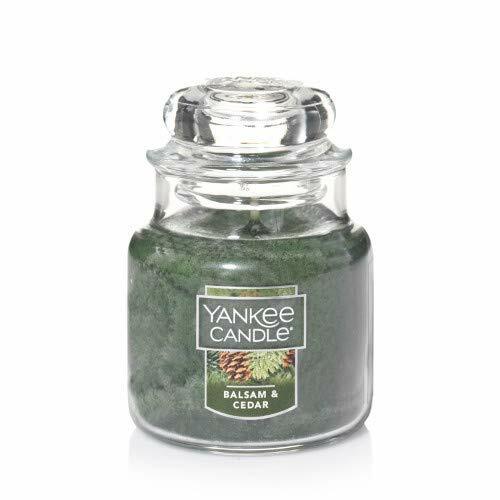 About Small Classic Jar Candles: This little 3.7-oz gem is a good pick for sampling fragrances. Although it's small, trust us--the fragrance is still big. Each is made right here in America with premium-grade paraffin of the finest quality ingredients from around the world. Fun fact--we select the perfect wick type for each specific fragrance to ensure the very best quality burn. Who knew? (20-30 hours burn time).